﻿For nearly a month the Occupy Wall Street protesters have been camping in Zuccotti park, but that may change soon. ﻿﻿Mayor Bloomberg has announced that cleaning crews will soon begin to clean the park and that protesters will be allowed to return as the work is completed. The panorama image above was taken on Oct. 11 and consists of over 75 images stitched together with software to represent an immersive view of Zuccotti Park. 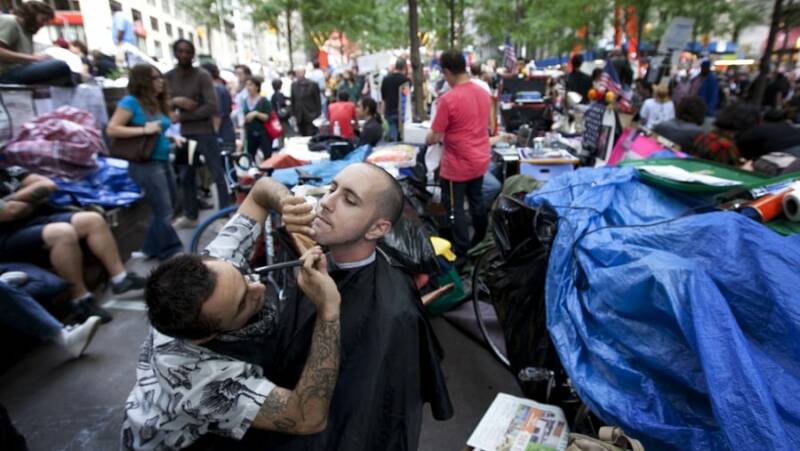 Phil Lendz offers a free shave to a customer at the Occupy Wall Street encampment in Zuccotti Park.